Hail you, the ‘Poet Laureate of Rowing’! Dear Father Thames was your soul’s universe. - the old English style was on the programme. And feel her smoothly on the water glide. Still searching, gazing for that ‘Perfect Oar’? Rudolph Chambers – known as ‘R.C.’ or Rudie – Lehmann (3 January 1856 – 22 January 1929) was a poet, man of letters, humourist, oarsman, rowing coach, and sat in the Commons as a Liberal MP from 1906 to 1910. He was educated at Trinity College, Cambridge, where he was the president of the Union Society in 1876. Although a keen rower, he never made it to the Cambridge Blue boat. 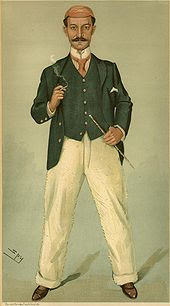 Lehmann rowed at Henley Royal Regatta in several races from 1877 to 1888, and has the noteworthy record of finishing last in every heat he participated in. In spring 1889, he began editing the undergraduates’ magazine Granta, and had his first piece published in Punch in the winter that year. Four months later, he was hired by the magazine to be on the editorial staff. His writings appeared in Punch until 1919. 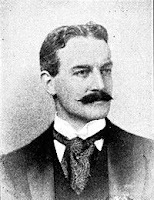 Lehmann was the finishing coach for either Oxford or Cambridge during 1891-1903 (for both in 1892!). He also coached Leander Club, Trinity College, Dublin, Berlin Ruderklub, and Harvard University. Lehmann arrived at Cambridge, Massachusetts in November 1896 to coach Harvard, who at the time was in despair. He returned to England for Christmas, but came back to the US in the spring of 1897. In June that year, he was awarded an honorary degree at Harvard. In December, Teddy Roosevelt gave a dinner in Washington in honour of Rudie Lehmann’s services for rowing in England and the US. Lehmann also coached Harvard the next season, in 1898, and in September, he married Alice Mary Davis in Worcester, Massachusetts. Miss Davis was 24 years old, and Rudie was 42. They had four children, Helen, Rosamond, the novelist, Beatrix, the actress, and John, who also became a famous man of letters. 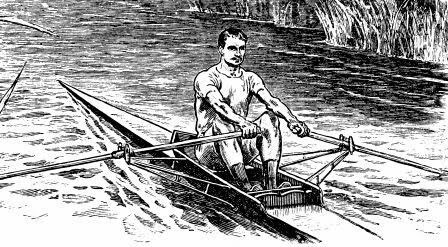 Rudie Lehmann is still remembered today for his two books on rowing, Rowing (1897) and The Complete Oarsman (1908); his little pamphlet Tubbing (1882) is today impossible to get hold of. Among his most well-known light verse on rowing are “The Oarsman’s Farewell to his Oar”, “A Trinity Boating Song”, “Style and the Oar”, and “The Perfect Oar”. So, what are the newspapers writing about yesterday’s Yale-Harvard Regatta? The two papers in Boston have articles and so has the paper in New Haven. New London’s newspaper The Day has a couple of articles about the race, but also from the famous ‘rock’ and from Red Top, Harvard’s boathouse by the Thames River. You will also find links to Harvard’s and Yale’s athletic web sites below. Click on the links to read the articles. The Day also has two short, but nice videos about the race. Click below to watch them (and, yes, these DVDs can be bought from The Day). Samuel Hazard Gillespie Jr. - A Supporter of Yale Rowing For 70 Years! A good story that was told yesterday at the Harvard-Yale Regatta on the Thames River was the one about Samuel Hazard Gillespie Jr. The first time he saw the Harvard-Yale race was in 1922, then from his father’s yacht, Harmony. Yesterday, he was back again, now on his own boat, Venture, which acted as the judge boat at the finish line. Gillespie bought this sail boat 30 years ago, in 1980, at the age of 70. “I named her Venture because it was quite a venture at my age,” he told the New London local newspaper, The Day, in an interview the other day. 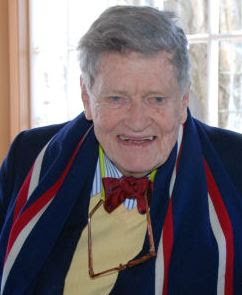 Samuel Hazard Gillespie Jr., Yale class of 1932 (and 1935 graduate of Yale Law School), who was a coxswain for Yale for three years, has now supported Yale rowing for 70 years. Ever since Gillespie bought Venture, he has sailed her from his home in Piermont, New York state, on the Hudson River up to New London to watch the race. Gillespie is still working at the Davis Polk & Wardwell law firm in New York City, where he has worked since 1948. He has argued several cases before the U.S. Supreme Court and has served as U.S. Attorney for the Southern District of New York under the Eisenhower administration, one can read in the program of the 145th Harvard-Yale Regatta. On 12 July 2010, Samuel Hazard Gillespie Jr., will turn 100 years young. He is expected to celebrate this with 100 relatives at the Century Club in New York. Please, allow me to say ‘Happy Birthday’ in advance! Labels: Harvard-Yale Regatta, Samuel Hazard Gillespie Jr.
Harvard coach Harry Parker and his varsity's winning crew: cox Kelly Evans, stroke Patrick Lapage, 7 Matt Edstein, 6 Nick Jordan, 5 David Wakulich, 4 Sam O'Connor, 3 Michael DiSanto, 2 Anthony Locke, bow Blake Pucsek (captain). You had to be up and about early if you wanted to watch the first race between Harvard and Yale this morning. The freshmen’s race started already at 9:00 a.m., or a little thereafter. Last year, this race was won by Harvard at a time of 10:43.2, which was seven seconds faster than Yale’s 10:50.1. With cloudy skies, good water conditions, and a tailwind to push the two crews up the Thames River for their 2-mile race this morning, the Crimsons had no problem to take an early lead in the race. The Harvard crew crossed the finish line at 9:32.7 and Yale at 9:47.6. This was the Harvard freshmen’s fourth straight win, rowing against Yale. A symbol for Harvard's clean sweep: the Rock is Red! Harvard’s second varsity boat also took an early lead in the three-mile race that followed the first race. 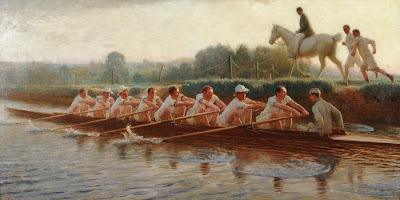 During the race, the Crimsons had a comfortable lead and there was never any question of which crew was going to claim the victory. Harvard’s winning time was 14:46.8. Yale was three boat lengths behind and crossed the finish line at 15:02.4. This was a repeat from last year when Harvard’s second varsity also won, but then only with two seconds. For the main event in this regatta, the four-mile race between the universities' varsity boats, which started close to 11:00, the tailwind had shifted into a west crosswind, which is more difficult to row in. Like the Crimsons’ freshmen and second varsity, the varsity crew was rowing with longer strokes and under-stroked the Yale crew, which had a three-seat lead for most of the first mile. Harvard had, however, caught up with the Bulldogs before the 2-mile mark, and at 2.5 miles the Crimsons had a boat length lead. Even if the Yale crew fought bravely and refused to let go of the crew in front of them, Harvard rowed more relaxed knowing that they were going to claim their third straight victory. Harvard’s winning time was 19:40.3, and six seconds slower came Yale at 19:46.2. The Crimsons’ varsity now extended its all-time lead to 91 against Yale’s 54. 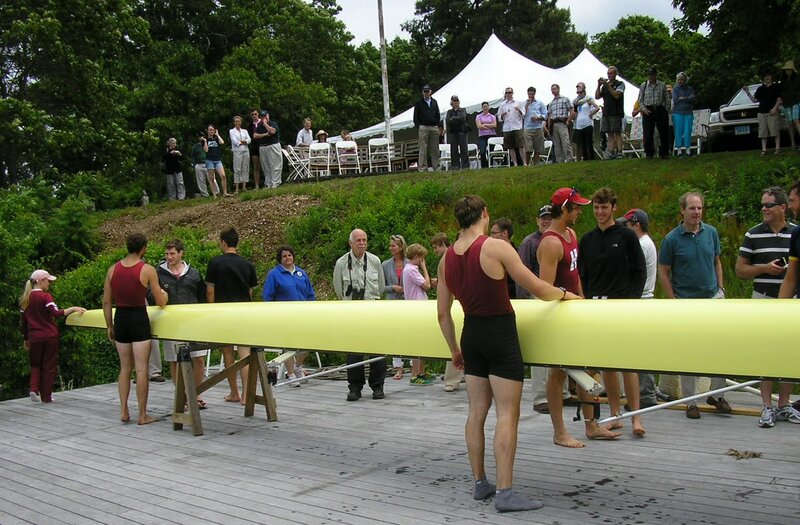 At Harvard’s boathouse, Red Top, a broom was quickly fetched from a closet to mark Harvard’s clean sweep. The broom travelled from oarsman to oarsman, and, of course to Kelly Evans, Harvard varsity’s female coxswain. As the tradition demands, she ended up in the water, as did the rest of the crew, whether they liked it or not. 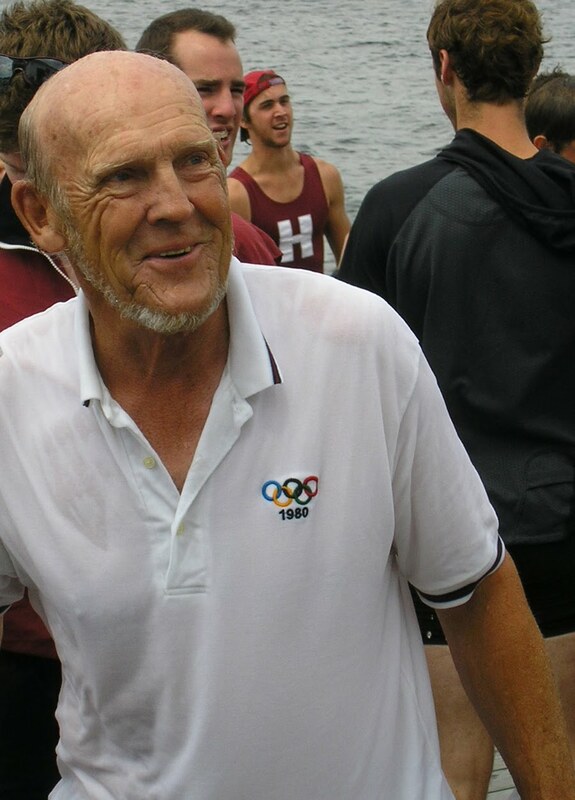 The crew’s legendary coach Harry Parker, who was doing his 48th season and has more victories under his belt than any other American coach, knew that he was also going to end up in the drink. So after his shoes and socks were removed, 1-2-3 and off he went high up in the air, only to land with a splash in the Thames River’s cold water. The smile on his face when he came up on the dock again told us that he did not mind. The 145th Yale-Harvard Regatta, which is the oldest intercollegiate athletic contest in the US, is tomorrow, Saturday morning on the Thames River, New London, Connecticut. The first race, for the freshmen, starts at 9:00 a.m., and will be followed by the junior varsity race. 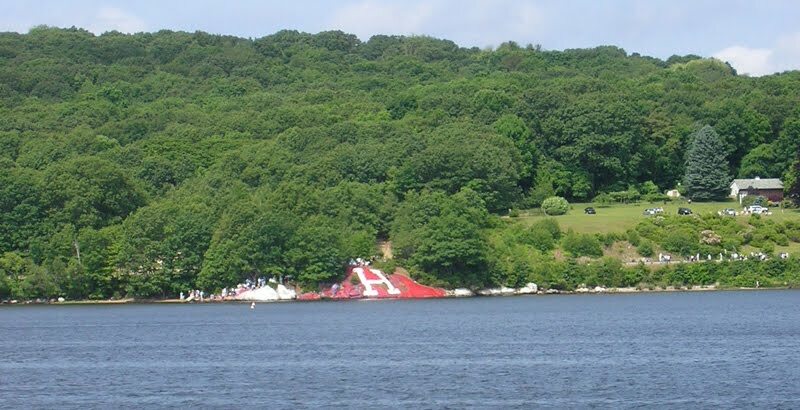 The varsity race will start at 10:45 a.m. All three races can be watched from several locations along the river, but Bartlett’s Cove, which is very close to the finish line, is the most popular place. The races will also be broadcasted on WKNL Kool 101 (100.9) and kool101fm.com. As usual, Charlie Hamlin (Harvard '70) and Yale lightweight coach Andy Card will be the ones giving us the excitement going on out on the water. 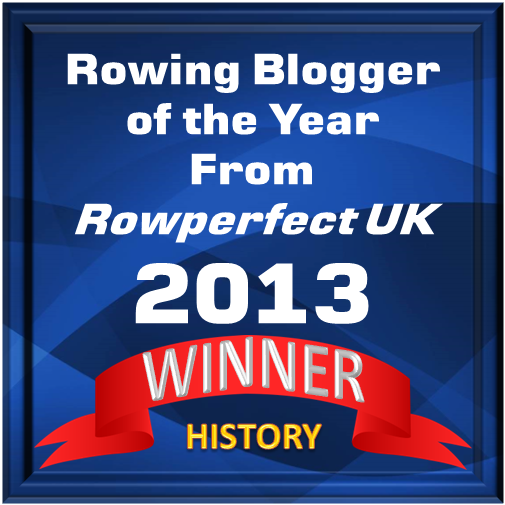 Today, I received an exciting e-mail from rower and rowing historian Michael Grace of New Zealand. 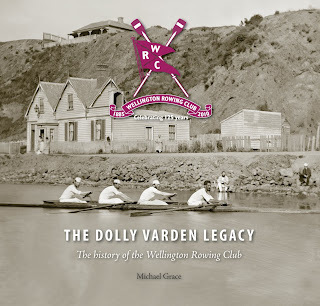 He writes that at his club, Wellington RC’s 125th anniversary celebration on 15-16 May, Michael’s book, The Dolly Varden Legacy, on the club’s history was launched with great success. I had the pleasure to help Michael in September last year with some information and material I had on Tom Sullivan. Tom Sullivan, who was a great professional sculler and later also a coach, was a member of Wellington RC, and of course there is a lot about Sullivan in Michael’s book. 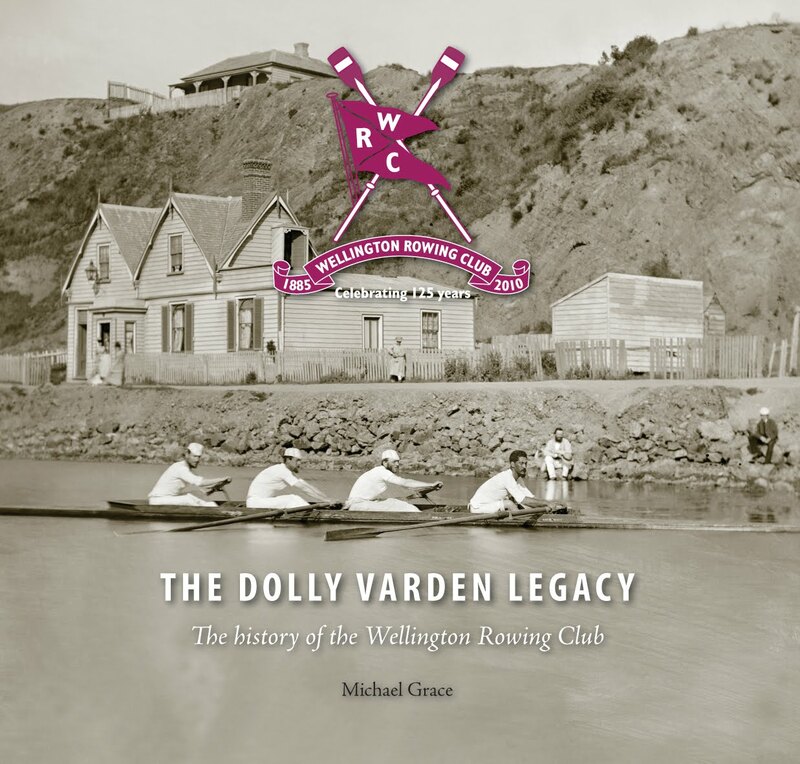 If you are interested in The Dolly Varden Legacy by Michael Grace, copies are available to purchase from the Wellington RC’s web site. The book is NZ$35, plus NZ$20 for international shipping (through PayPal). Click here to order. Thank you, Michael for your information, and good luck selling the book! Endure the ache in his sides. The gods went on alert. On the bosom of the water. The passive sky was a placid blue. So, who were these professional oarsmen who had signed an agreement to boycott Charles Courtney “in order to protect” themselves and not row with or against him in any regatta, which I wrote about in yesterday’s entry? On the web you can find information about Wallace Ross and James A Ten Eyck on Wikipedia. 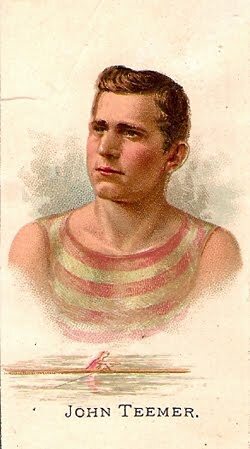 (Ten Eyck’s son, Edward Hanlan Ten Eyck, would become the first American to win the Diamonds at Henley in 1897; the Henley Stewards’ did not invite him back the following year, due to the fact that his father had been a professional sculler.) 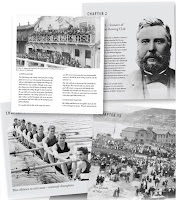 Rowing historian Bill Miller has written an introduction to Fred Plaisted (seen down on the left) as the National Rowing Foundation has Plaisted’s scrapbook at Mystic Seaport Museum. 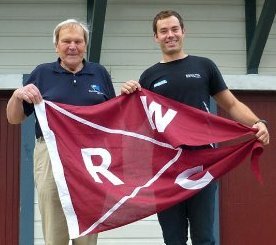 George Hosmer (seen up on the left), John Teemer (seen up on the right), and James Riley (in The New York Times article mentioned yesterday spelled 'Reilly') are all in Bill Pickelhaupt’s eminent article “Professional Rowing in the United States and Canada” in the magazine Maritime Life and Traditions, No. 17, winter 2002. Both Plaisted and Riley seemed to have been real characters. 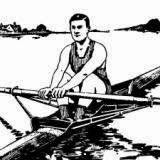 Two books that have interesting information about professional oarsmen in America are Rowing (1923) by R.A. and R.J. Glendon and American Rowing (1932) by Robert Kelley; both books are not easy to find, but do try abebooks.com from time to time. 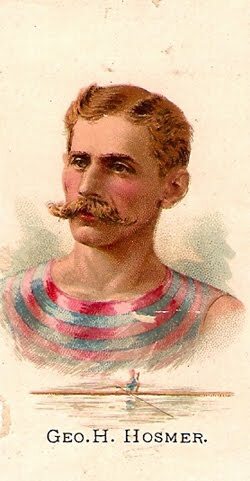 Today, Chris Partridge at Rowing For Pleasure, has followed in my wake to also write about American professional sculler Charles E. Courtney. Chris mentions things from Courtney’s childhood that might interest you. Go to Chris's entry by clicking here. Some years back, I did a lot of research for an article about Charles E. Courtney (1849-1920; up on the left) and professional rowing in America. While there are quite a few books and articles about professional oarsmanship in North America, there are not that many books about Courtney, which surprised me. 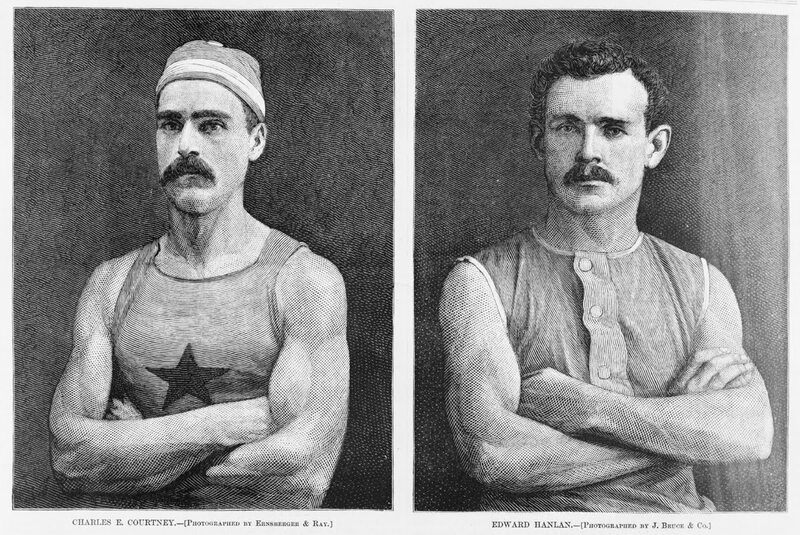 After all, he was the most famous and successful sculler on the south side of the Canadian border; of course, Ned Hanlan (1855-1908; up on the right) of Toronto being the most famous sculler north of the Canadian border, and probably in the world when he was World Sculling Champion in 1880 to 1884. My article, “Charles Courtney and the Decline of Professional Sculling in America”, which was published in The Log of Mystic Seaport, Vol. 56, No. 1, 2005, is, as the title suggests, also about the deterioration of American professional sculling. Courtney and Hanlan met three times to row for the American champion title and to collect a heap of money doing so. Never had there been so much publicity before a rowing race as when Courtney and Hanlan met on 3 October 1878, a five-mile race which the Canadian won, but not with the same ease as he had beaten other opponents. A re-match was eventually set for 16 October 1879. On the morning of the race, Courtney found his racing shell sawed in half. The race was however not postponed, and as Courtney refused to race in a borrowed shell, Hanlan rowed the five-mile course on his own, but found out after the race when he went to collect his prize money, $6,000, that the president of the Hop Bitters Company, which bottled the patented medicine “The Invalid’s Friend and Hope”, and who had set up the prize money, had already left town with the money, claiming that one man in a shell does not make a rowing race. And it was probably here it started, the beginning of the end of professional sculling in the US. Had Hanlan had some of his men to saw Courtney’s shell in half, or was it Courtney or one of his men who had damaged his boat? We will never know. On 19 May, 1880, the two North Americans met for their third race, again for a wager of $6,000. A few minutes into the race, Hanlan was far ahead. Halfway to the turning stake, Courtney stopped, and rowed back to his dock. The Canadian continued to row the full course and claimed the prize money. Six months later, Hanlan easily beat the World Champion Ned Trickett of Australia on the Thames in London. Books on Charles Courtney, Margaret Look’s Courtney: Master Oarsman – Champion Coach (1989) and C.V.P. Yong’s Courtney and Cornell Rowing (1923), only briefly talk about Courtney’s career as a professional oarsman after the American's last race against the Canadian. Instead, at length the authors write about Courtney’s successful career as a coach at Cornell University which began in 1883, but was only for ten days. 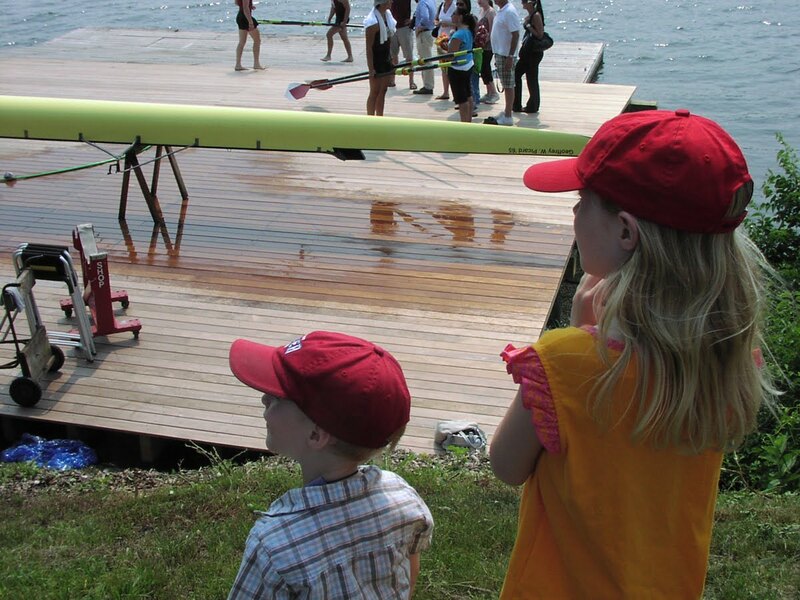 Two years later, Courtney was hired to coach the Cornell Navy’s crews full time. This is the first time I read or heard about this agreement between the professionals to boycott Charles Courtney. I know that he was a man of controversy, also as a coach for Cornell (see my entry on 5 December, 2009: ‘Americans at Henley in 1895’), but I am astonished by this article. Is there anyone who can explain what happened that led to this boycott of Courtney? 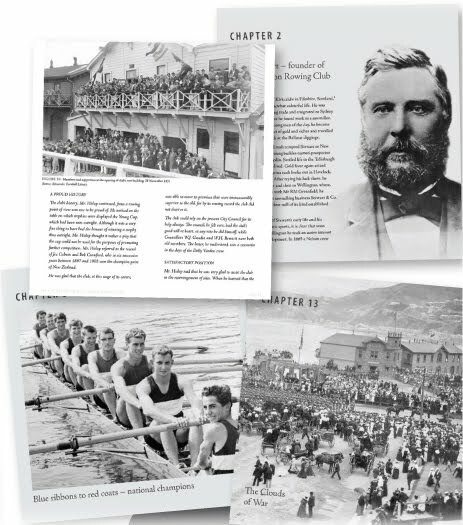 In an attempt to save money some national rowing federations ceased publishing their magazines, or turned them into electronic magazines or newsletters. It is therefore refreshing to hear that the French Rowing Federation is going (or maybe rowing) against the flood to revitalize its publication, or in the words of Hélène Rémond, “revolutionized its publication”. 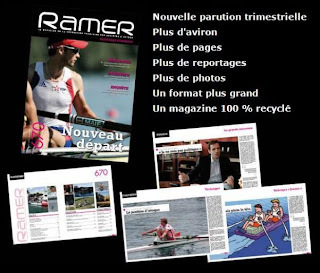 In an e-mail Hélène writes that the Fédération Française des Sociétés d’Aviron, FFSA, has decided to create a magazine that is more attractive and better “suit the lovers of the sport.” She continues “The magazine’s previous title was Aviron and has now been changed into Ramer” - both words mean ‘rowing’ (with 'ramer' being the verb, and 'aviron' being the name of the sport). The magazine, which now has a larger format and is printed on recycled paper, went from 44 pages up to 64 pages with more photographs, interviews, reports, etc. Earlier it was a bimonthly magazine which has now changed to quarterly. Hélène also mentions that in the first issue there is an article about Leander Club. Hélène wonders if other printed rowing magazines like the ones published in the USA, Great Britain, and Sweden are all published quarterly, too? Well, the Swedish Svensk Rodd is published quarterly, while the American Rowing News (formerly Independent Rowing News, which obviously is not published by USRowing) is a bi-weekly magazine, and British Rowing’s Rowing & Regatta is published ten times a year. I wish Ramer good luck, and thank you, Hélène for sharing these interesting news. Besides writing articles for some rowing magazines and trying to keep this blog running, the other month I began doing research for a non-rowing related project about my favourite Swedish author, Frans G Bengtsson, and his wonderful two-volume novel The Long Ships (1941; 1945; Eng. ed. 1954), and its English translator, Michael Meyer. In October 1939, Meyer went up to Oxford to read English at Christ Church. He simply picked Oxford because his nanny had cheered on Oxford in the annual Boat Race. Meyer would become a well-known translator of August Strindberg’s and Henrik Ibsen’s works, but at Oxford he had his mind set to become a poet. He sent off a poem to the university’s literary magazine, Cherwell. He soon got a reply from the magazine’s editor, Keith Douglas (to the left), that his little piece was accepted for publication. Douglas, who was a dashing-looking fellow, quickly made Meyer a sub-editor for Cherwell. Meyer agreed to this, although he sometimes found Douglas a difficult person. But there was no question about Douglas’s ability to write poems. After Keith Douglas left Oxford in the summer of 1940, he immediately joined the Army, and handed over the editorship of Cherwell to Meyer. A year later, when Michael Meyer and his friend and fellow poet, Sidney Keyes, edited and published Eight Oxford Poets, some of Keith Douglas’s poems were included. Among them, Meyer especially liked ‘Canoe’ as, Meyer would later write, it “perfectly captures the atmosphere of Oxford around the time France fell” (in June, 1940). 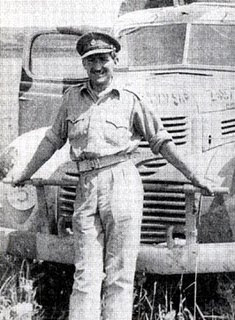 Douglas’s battle experience during the North African Campaign, from 1942 to 1943, was posthumously published in 1946, Alamein to Zem Zem, which was a prose account with poems and his own drawings. Captain Keith Douglas was killed on 9 June 1944 in France, three days after he had participated in the invasion of Normandy. In the same e-mail to Tim, Mr. Elder has also attached a photograph (see above) of the War Memorial which Tim mentioned in the Thursday entry. Among other things, Mr. Elder writes, “You can also see the left hand plaque ’Dulce et decorum est’ in place.” He also mentions that the furniture and replaced plaques should be back very shortly due to the renovations made now when Thames RC is celebrating its first 150 years. ’Dulce et decorum est’ is also the title of a war poem by the famous Wilfred Owen (1893-1918). He was killed at the Battle of the Sambre, just a week before the war ended. His poem, which shows the horror of war, was published in 1920. If you are interested in war poetry, please go to Professor Tim Kendall's eminent blog War Poetry. Tim also sent me a link to a list of the 42 Blues killed during the First World War, in 1914-1918. Click on the link and scroll down the page and there you will find a link to the 270 Henley competitors killed in that war. Last year, I posted a long article - in two entries - about one famous oarsman on these lists, F.S. Kelly, who was killed in 1916. Click here to read these entries. My warmest thanks to Tim Koch and James Elder for their great contributions to this entry, and a special thank you to Thames RC for allowing me to post ‘In The Golden Days’ on my blog! Kensington also has what I think may be a unique memorial. It is a bound album with studio photographs of the seventy five of its members who served in the First War, fifteen of whom died. The picture of Colin Mills, who was killed in 1916, is made especially poignant by the letter that we have that was sent from his sergeant to his mother explaining ‘that he could not possibly felt any pain’. It is with extreme sorrow that I have to inform you that your son, and our dear friend, Colin was killed yesterday in the trenches at Loos. Corporal Hughes and I were standing with him discussing a discovery he had made in connection with our work, when he was hit by a bullet in the head. The parapet was rather low and he must have been slightly exposed to the German lines. He received immediate attention from our stretch bearers who were at hand and everything possible was done for him. Afterwards he was taken down to our dressing station, which I had notified, and the R.A.M.C. were waiting with the ambulance which at once took him to the Hospital, all, however, was of no avail, and he died shortly after without regaining consciousness. Our Medical Officer assured me that he could not possibly have felt any pain. I cannot express the grief felt by all of us who knew him so well, for never have we known one of such a good nature and loveable character. When he joined us in October he immediately became popular and always remained so. In his work with the Company and later, as an observer and sharp shooter he has always been one of my most reliable men. His sad loss has left an absolute gap in our circle and our affections. We all desire to express our deep regret and sympathy with you in your sad loss. My warmest thanks to Tim for two very intresting and touching entries! “Every man thinks meanly of himself for not having been a soldier [...] were Socrates and Charles the Twelfth of Sweden both present in any company, and Socrates to say, 'Follow me, and hear a lecture on philosophy;' and Charles, laying his hand on his sword, to say, 'Follow me, and dethrone the Czar;' a man would be ashamed to follow Socrates. Sir, the impression is universal; yet it is strange”. All wars are tragic but the carnage of the 1914-1918 War, 'The Great War', is especially poignant. In Britain in August 1914, oarsmen would have been the first to volunteer for the war that was to 'be over by Christmas'. They were young, fit and subject to the peer pressure of the crew and club. Men from the same street, workplace, college or sports club joined up in groups and were put in the same battalions. In Auriol Kensington we have a picture of the Kensington eight that won at Molesey Regatta in 1914. Four years later, four of them were dead. Three of the Auriol RC Henley Thames Cup crew of 1914 were killed. Auriol RC and Kensington RC amalgamated in 1981 and so have separate War Memorials. Auriol has a richly illuminated scroll which was altered to add the names of those who fell in the Second World War (see above at the very top on the right). Kensington has two brass plaques, one for each of the conflicts (see above on the left). Tim will continue on this interesting topic in an entry which will be posted tomorrow! I would like to add something to my entry from yesterday about George Duncan Rowe. In 1895, George Duncan Rowe and Fred Pitman, both stock-brokers, founded the firm Rowe & Pitman in London. 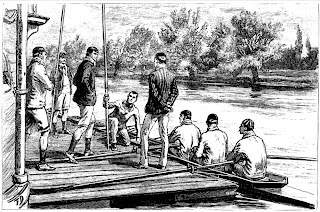 While Rowe had rowed at Oxford, Pitman, who was educated at Eton, had rowed and stroked an eight at Trinity College, Cambridge in 1884 to 1886. The rowing connection seemed to be important for Rowe and Pitman. They had oarsmen, sometimes fresh out of Oxford and Cambridge, to join their firm. Two examples are Malcolm ‘Moppy’ Pilkington, who rowed at Oxford in 1893-1895, and Fred Pitman’s nephew, Frederick Hugo Pitman, who rowed at Oxford and was the bowman in the winning crew of the 1912 Boat Race. The same year, he also rowed in the New College eight that took a silver medal in the Olympic Rowing Regatta in Stockholm. And, as we now know, there was also George Duncan Rowe. 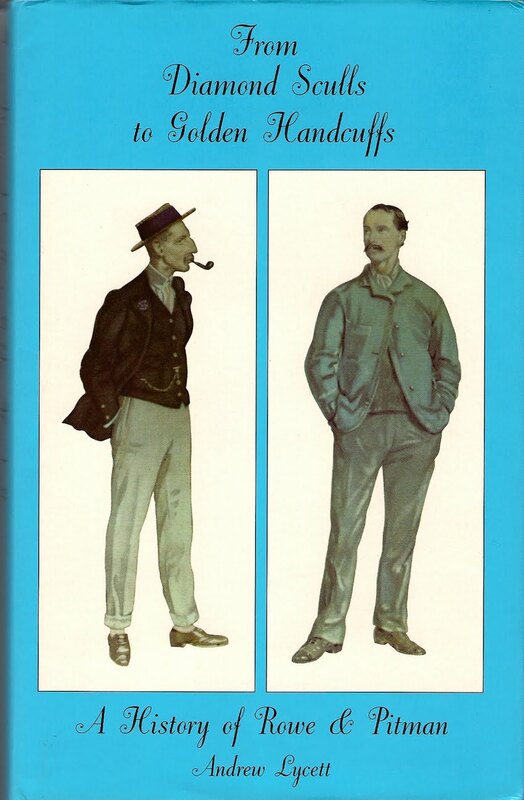 In 1998, Andrew Lycett published a book called From Diamond Sculls to Golden Handcuffs: A History of Rowe & Pitman. Some years ago, when I saw the book on the web site of an antiquarian bookseller, I found the title thrilling. I ordered it (it cost a few pounds), and I still remember how utterly disappointed I was after reading the first two, three chapters. 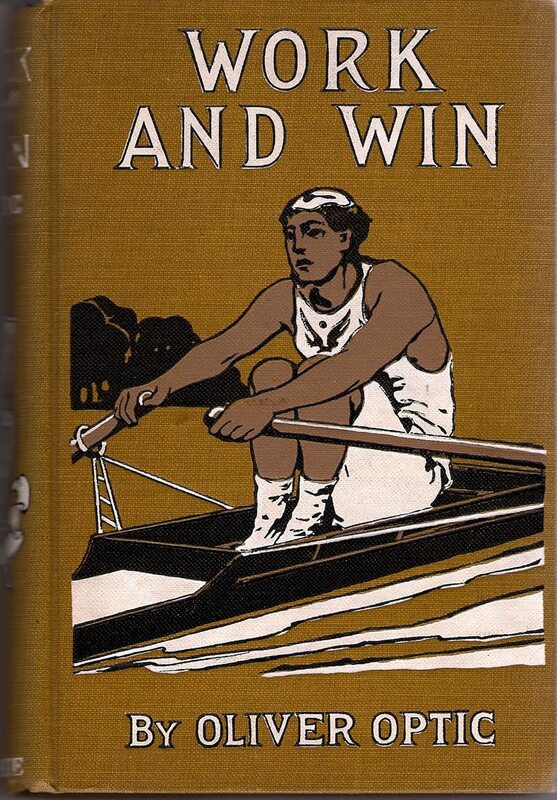 The title is terribly inaccurate as the only ‘rowing’ mentioned is 8 lines for George Rowe’s and Fred Pitman’s collected rowing achievements, 3 lines for ‘Moppy’ Pilkinton, and 3 lines for Hugo Pitman. There is nothing about Henley, despite the ‘Diamond Sculls’ in the title. Not even when the creator of the James Bond books, Ian Fleming, shows up in the book as an associate in the Rowe & Pitman firm, did that hold my interest. This [‘rowing’] book is awfully, horribly boring! Let us stay at the bay of Djurgårdsbrunnsviken in Stockholm for a little while. As I mentioned in my entry of yesterday, the 1912 Olympic Rowing Regatta was held on these waters between 17 and 19 of July. The club house of Stockholms Roddförening , one of Sweden’s most prominent rowing clubs at the time, was the Swedish Olympic Rowing Committee’s headquarters. In the old photograph above from the Olympic regatta, we can see how the place is buzzing with people, boats, and activities. 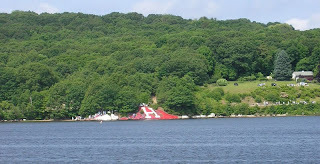 The participating rowing nations' flags are raised on flag poles outside the boat house. What caught my eye is the fellow standing slightly to the right, with a distinguished profile and a hand in his right-hand pocket, gazing out on the water, maybe looking for his crew, the eight that took the Olympic gold medal. 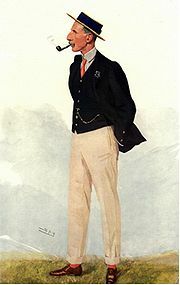 The gentleman is none other than George Duncan Rowe (1857-1934) of the Leander Club. Rowe, who was the great-great grandson of Nicholas Rowe, Poet Laureate to George I, was educated at Marlborough College where he played cricket – and very seriously, one might add. If he missed a catch or made another mistake in a match, after the match he would hand in his resignation, which always was turned down by the team captain. Rowe went to Oxford where he took up rowing. 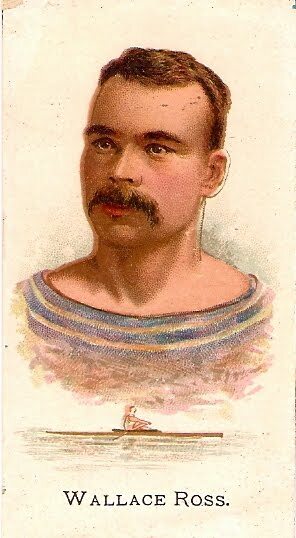 He rowed in The Boat Race twice, in 1879 (losing) and in 1880 (winning), the latter year as its President. He became a member of Leander Club and was later the club’s Honorary Secretary and also Captain of the Boats. In 1919, Rowe was elected President of the club. At every annual dinner he would offer his resignation, which would be totally ignored by the members. (His resignation from the Presidency came in February 1934, when he died.) For many years, he was also a Steward at Henley. Rowe married late in life. The year after the Olympic Games in Stockholm, he found himself at a dinner party where he was asked to accompany a young lady on the piano when she was playing the violin. Every time he made a mistake she hit him on the head with her bow. A short while later they married. She, Frances, was 21 years old, Rowe was 56. They had seven children; the sixth of them was Antony Duncan Rowe (1924-2003), who was also a famous oarsman. Gant, the international company of clothing and accessories, has gone into the rowing business. On Saturday 22 May, the first Gant Rowing Race is to be held on the waters of Djurgårdsbrunnsviken in Stockholm between Sweden’s most prominent boarding schools, Sigtunaskolan Humanistiska Läroverket and Lundsbergs skola. Although, these schools have their roots from a model of English boarding schools, in a press release from Gant’s office in Stockholm, the Gant Rowing Race is inspired by the annual boat race between the two Ivy League universities on the American east coast, Yale and Harvard. This, of course, is due to Gant being a brand of American heritage, launched in New Haven, Connecticut in 1949. Beginning at 1:00 p.m. there will be three races for men and women in single scull, double scull, and quadruple scull, or coxless fours (the press release was a little vague on the latter boat types). The course on the bay of Djurgårdsbrunnsviken is around 800 metres from the Nobel Park to the waters outside the maritime museum, Sjöhistoriska museet. In 1912, the Olympic rowing regatta was held on Djurgårdsbrunnsviken, but the course was then 2,000 metres. You will find interviews with the crews, training videos, and more information about the race by clicking here. On Saturday 29 May, it is time for the 145th boat race between Yale and Harvard on the Thames River in Connecticut. Last year’s races ended up with a clean sweep for Harvard, who has won nine of the ten last races in the varsity boat. It was the 40th win for Harvard’s Head Coach Harry Parker. Last year’s races were rowed downstream with the finish line just under the Gold Star Memorial Bridge, where mostly Yale fans had gathered. I have had a hard time trying to find information about the races on 29 May, as both Harvard and Yale, as of yet, have not published much information on their web sites about what times the races are going to be held, or if they are going up or down the river. However, the May/June issue of the Harvard Magazine has an article about Red Top, Harvard’s boat house by the Thames River. 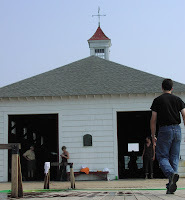 For the 2008 races, I was actually invited for the Boat Race Luncheon at The Lighthouse Inn in New London. Both Harry Parker, coach for Harvard, and John Pescatore, Yale’s heavy men’s coach, gave some short speeches about how they thought the races were going to end up. It was also at this nice occasion the draws were made for which crews were going to row on the New London or Groton side of the river. Having a special invitation, my family and I watched the races from Red Top. I would like to mention that my dear wife was a very good sport about it, as her family is full of old Yalies. Let us see if any of the three crews from Yale can claim a trophy on 29 May! All boats in the London2Paris Challenge crossed the finish line yesterday, Chris Partridge writes on his blog ‘Rowing for Pleasure’. The race was not without difficulties as it run into terrible weather. Read more on Chris’s eminent blog by clicking here. Among the oarsmen in the 1913 Oxford crew, R. P. Hankinson (New College) was killed during the First World War. He, together with twenty other old blues from Oxford – and twenty-one old blues from Cambridge –, gave their lives so others could live. I sometimes think about these young men, well, boys, who we see smiling into a camera looking invincible and carefree. I think of what they missed in life, and the grief their families and friends must have gone through losing them on a foreign field. 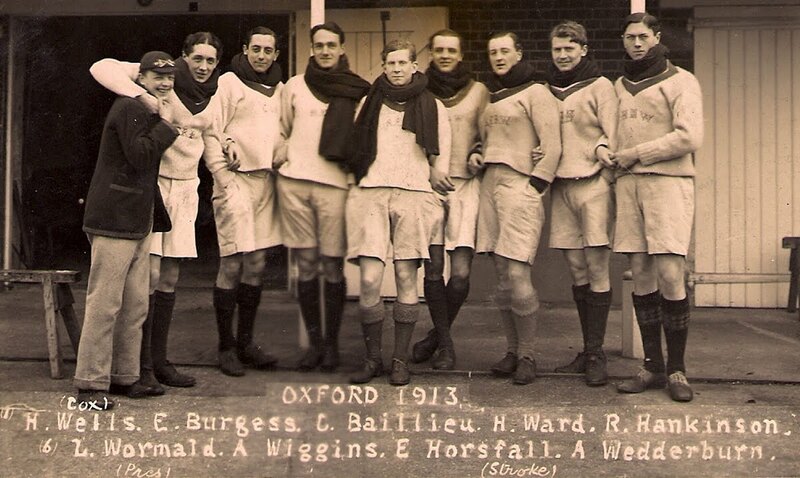 Here is a nice photograph of a relaxed Oxford crew of 1913. From the left: H. Wells (cox), E. Burgess, C. Baillieu, H. Ward, R. Hankinson, L. Wormald, A. Wiggins, E. Horsfall (stroke), and A. Wedderburn. 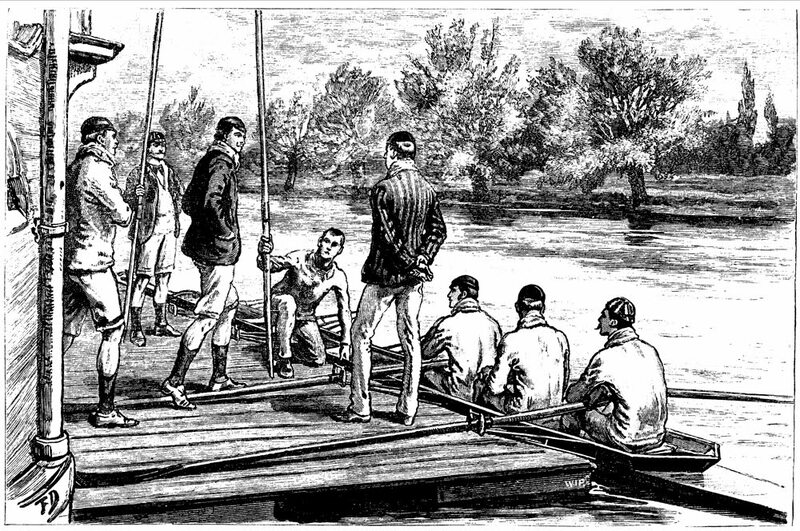 On 13 March, these boys won the Boat Race, which has been described as “a most thrilling race”. After four winning races, Bob Bourne was not stroking anymore, nor was his father, Dr. C.G. Bourne, the coach for the dark blues. But they did not lack experience. Wells and Wormald had won the Boat Race also in 1911 and 1912, and both Wedderburn and Wiggins in 1912. That latter year, Wells, Burgess, Wormald, and Horsfall had won an Olympic gold medal in the eights at the Games held in Stockholm (rowing for Leander). The following year, 1914, Ward, Horsfall, Wiggins, and coxswain Wells were still in the dark blue boat, but this year Oxford did not stand a chance to Cambridge powerful row. The light blues won by 4 ½ lengths. Following is a newsreel from the 1914 race on the Thames on 28 March. Here Biddle Morris continues his story about rowing the Elizabeth Islands from Woods Hole to Cuttyhunk. Here I am rowing off Naushon Island. I know I have opened my back up way to early, but it was a long day and I was tired! After entering Vineyard Sound and rounding Jobe Neck there is a nice beach on which to land (some signs have to be ignored). The next stop will be Tarpaulin Cove and its lighthouse. At some point you have to cross over Buzzards Bay to enter Cuttyhunk Harbor. Take Quicks Hole and try not to go on to Canapitsit Channel. Quicks is wide and has a beautiful beach on its eastern side, and if the tide has turned you can land and just walk your boat through. If you have a reservation at the Cuttyhunk Fishing Club (tel. #508-992-5585, and you have be advised to call, since it is the only place to stay and it is popular), land just after you enter the harbor, take your boat out by the pier and walk to the club. Since you rowed down mostly with the current, you will have to row back against the current. Not a problem. The current in Vineyard Sound may be 2.5 knots, but in Buzzards Bay it is only .5 knots against you and only for a few hours. Buzzards Bay changes three hours before Vineyard Sound. The prevailing winds are usually out of the southeast so you should be in the lee. A good rest stop is Kettle Cove on Naushon Island. Now is the time to check the tide and current charts and see if we are entering Hadley Harbor and Woods Hole under the right conditions. If all looks good, look for the entrance to Hadley a little ways past Weepecket Island. It is hard to see and does not look like an entrance. Remember, if the "hole" is too dangerous to cross you can try going back into Buzzards Bay. Go way out and around to get beyond the tidal rip, and back to that beach on the northeast side of Penzance Point. Better yet, stay in Hadley and wait for the tide to change. Here are a couple of issues to be prepared for. All open water rowers need to think safety. First, be prepared to spend the night on one of the beautiful islands. This has happened to me twice (once by choice). I spent a lovely night sleeping on the beach in Tarpaulin Cove (not allowed) and on the beach on Weepecket Island (tolerated). Once I had to turn back in a stiff wind and surf back to Woods Hole, and once I had to wait out strong winds on Penikese Island on a day trip across Buzzards Bay from Rhode Island. Since I have slept at the inn on Cuttyhunk three or four times, you can figure the odds. Carry extra water, at least a bivy sac, something to eat, tick repellent (there are lots of them), and a VHS radio or cell phone. It is a fabulous trip for those who are adventuresome and in good shape. Biddle, many, many thanks for your great contribution! Biddle Morris is a well-known master/veteran oarsman on the Mystic River, and a true gentleman. He is a volunteer at the Rowing Hall of Fame and the rowing exhibit at Mystic Seaport Museum. Biddle has done tons of good things for the rowing community in the Mystic area and beyond. Not only is he rowing and racing on local rivers in Connecticut, he takes every opportunity to try a waterway in New England. Later this month, Biddle will have an article published in the Open Water Rowing Organization, IROW’s newsletter. 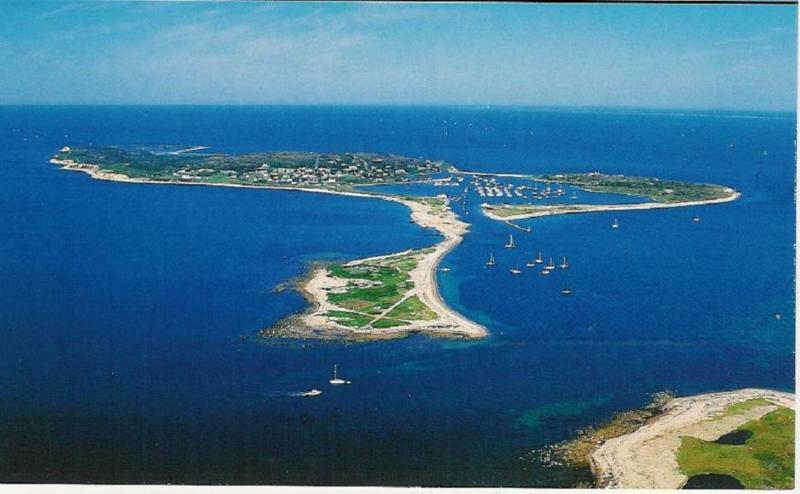 He has, however, agreed to give this blog’s reader a sneak peak of “Rowing the Elizabeth Islands from Woods Hole to Cuttyhunk”. The Elizabeth Islands are a chain of four main islands and numerous smaller islands, extending about fifteen miles southwest from Woods Hole to Cuttyhunk. Shore lines range from small beautiful beaches to rugged bluffs. Their relative inaccessibility and the fact that they are still controlled by the descendants of the original land grant family protect them from a lot of mainland traffic. There are a few hundred year round residences on Cuttyhunk and a few summer homes on the other islands. Twin monsters of wild tidal currents and wind driven seas make traveling here by small boat a special challenge. This should be put in the "do not try this at home" category. THIS IS FOR EXPERIENCED OPEN WATER ROWERS WHO ARE IN GOOD PHYSICAL SHAPE ONLY. The channels between the islands are called “holes” (Woods Hole, Robinsons Hole, Quicks Hole) because the current pours through these as if it is falling in a hole. The "hole" area of Woods Hole and the entire Canapitsit Channel cannot be crossed except at slack tide since the currents change very fast. With experience you will learn where all the "holes" are and how to avoid them. One should never go out alone in anything less than an Echo, Appledore pod, or an ocean kayak with spray skirt. The wind factor is unpredictable but can be minimized by leaving early in the morning. Listen to NOAA radio and do not go out if winds are above 5 to 10 knots. Do not launch or land on an east facing beach if winds are out of the east. If you are returning the next day, it will be early afternoon when you get back to Woods Hole. Try and catch the tides right but if that is not possible, there are a couple beach sites outside Woods Hole Harbor which I will describe later. The current factor is predictable but complicated. You are going to have to spend time studying Eldridge's tide chart and current tables. You should always try to time your leaving and returning to Woods Hole at slack tide. Eldridge has a tide chart for Woods Hole. Pick a slack high tide early in the morning. I recommend slack high because, strange as it seems, the tidal current ebbs to the west (Cuttyhunk) and floods to the east (Woods Hole). You therefore ride the ebb at least part way to Cuttyhunk. Now turn to the tidal current flip charts for Buzzards Bay and Vineyard Sound in Eldridge. This will give the current velocities and direction with arrows hour by hour for your whole trip. You need to bring this with you. I could write an entire article on these charts. One slight complication is that the current charts are based on the tide change at Pollock Rip, but that is only one half hour earlier than Woods Hole. So just factor the current a half hour after what the current chart shows. As I have said, there are several ways to start your trip. The simplest and the best is the following: you check NOAA and it is going to be 5-10 knots out of the west, shifting to the southeast in the evening. Good for a launch at the public boat ramp in Woods Hole and a trip down Vineyard Sound, where we will start out in the lee of the wind and mostly have a following current. I recommend the public boat ramp because it is relatively easy to find, has the best location right across from Hadley Harbor (one of my most favorite places) and close to the ferry to Martha’s Vineyard. That is important because you cannot leave a car at Woods Hole overnight. You have to leave your boat at the ramp, drive back to the public parking for the ferry, take the shuttle bus back to the ferry dock and walk back to the ramp. Allow at least 45 minutes for this. Just to the north of the ramp (about 100 yards) is a small beach owned by the Oceanographic Institute, outside the harbor on the northeast side of Penzance Point. Make a mental note of this. If, on the return to Woods Hole from Buzzards Bay, you miss the tide, you may go out and around Penzance Point, avoid the "hole" and land on that beach. Meanwhile, back at the ramp, we shove off at or slightly before slack high tide. This is important, because from the ramp you will be going straight across into Hadley Harbor. Once in the harbor, follow the channel to the left between Nonamesset Island, Goats Neck, and Naushon Island and then under a small causeway bridge into Vineyard Sound. You have about one and a half hours from slack tide at Woods Hole before the current is running too strong against you under that bridge. Yesterday, a rowing book arrived in the mail. 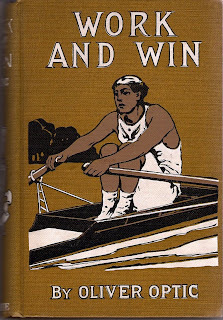 It is not a new book on rowing, and to be honest, it is maybe not that much of a rowing book either. The book is Work and Win by Oliver Optic (William Taylor Adams 1822-1897). What caught my eye was the cover of the book, a boy in a single scull. This book was first published in 1865 or 1866; my copy is of a much later date, probably mid-1900. 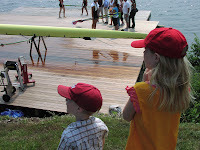 I have added it to my entry of 9 August, 2009, where I posted a list of juvenile books with rowing as a minor or major theme. Your recent comments about 'boaters' (flat topped straw hats) at Eton School in England prompts me to send a picture of such an item from my collection of rowing memorabilia [see above]. It was worn sometime in the 1880s by one of the crew of the boat 'Victory' in the 'Procession of Boats' which takes place every year on the school's ‘parents' day" known as the 'Fourth of June'. Eton School (more correctly called 'Eton College', though the boys are aged 13 to 18) is the most famous fee paying school in the world. Founded in 1440 by Henry VI, it has produced eighteen British Prime Ministers (however, by the time you read this, David Cameron could have made the number nineteen). Our interest is in the fact that it can lay claim to have invented rowing as an amateur sport - though Westminster School, founded 1179, may disagree. The earliest record of rowing for pleasure at the school dates from 1793. Until perhaps the First World War, it produced the majority of University Boat Race and Henley winners. The 'Fourth of June' is a celebration of the birthday of King George III (1738-1820), Eton's greatest patron. This year it is on 2nd June. 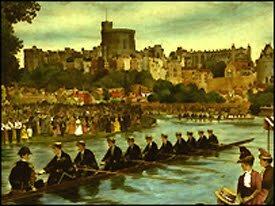 Various events take place on this day but the most famous is ‘The Procession of Boats’, in which the best crews from the top four years row past in clinker built, fixed pin eights. They wear uniforms of eighteenth century midshipmen, with the cox dressed as an admiral. The rowers have boaters sporting the name of their boat on their hat-bands and the school arms in metal, all decorated with fresh flowers. At a certain point, the entire crew and cox stand up in the boat with their oars erect. They face Windsor Castle, remove their hats and cheer the memory of George III. The ever reliable British Pathe web-site provides filmed evidence of these seemingly unlikely events. Some nice sound film from 1938. At forty seconds in, there is a brief shot of the 'Monarch', a ten-oar. The 'Monarch' was retired in 1990 after at least 100 years service and is now in the National Maritime Museum in Falmouth here in England. My collection also contains a programme from 'The Procession of Boats' of 1885. It shows many famous rowing names, notably Guy Nickalls, S.D. Muttlebury, C.M. Pitman and Lord Ampthill. Many thanks to Tim for this lovely contribution! A week ago, on Sunday 2 May, you could read a rare thing in The New York Times. The paper actually mentioned rowing, which these days is an extraordinary subject in this paper, ever since they sacked their rowing correspondent a couple of years ago. Of course, what Mr. Gill is thinking of is the oarsmen at Eton, the wet bobs, who, at times, wear boaters. Mr. Gill’s article reminds me of two things: firstly, how I landed a summer job in the 1990s at a fairly large newspaper back home in Sweden to write daily political articles. How I ever managed to get a three-month job trying to come up with well-written and insightful pieces on politics, I have long since forgotten, but I do remember that I made a brave attempt to squeeze in the Henley Royal Regatta in a piece I wrote about then Prime Minister, John Major, who was visiting Stockholm. Of course, I was a total failure at commenting on the political situation in Sweden and abroad, and it was with great relief I left the paper at the end of August; the Political Senior Editor thought so too. You chained fast to your desk and your chair? Of the pines, where your camp fire beams? And come in with dropped foot and set wing? That rises, then carries, then drives? Have you pulled out your heart at an oar? While you watch for the flash of the gun? When you’re rowing on pure nerve alone? While you grin to yourself if you can? It’s a game that was built for a man. Today, I am off to supervise some volunteers, Mystic Seaport Museum Pilots, in the Rowing Hall of Fame and the rowing exhibit 'Let Her Run'. This is the third time I am doing this, and I love it! We go through the stacks 'behind the scene' and sort and catalogue old rowing memorabilia for a whole day - wonderful! You never know what might show up. The always reliable rowing historian Tim Koch of Auriol Kensington RC, London, sent me some information about Sydney Swann Jr.,’s father, Sydney Swann Sr., (1862-1941), both whom I mentioned in my entry yesterday. Tim is forwarding The Times’s obituary from 1941. According to the piece in the paper, Rev. Sydney Swann was not only a great sportsman, he was also a pioneer motorist and airman. Rev. Swann could also add some rowing innovations to his long list of achievements. Among other things, he came up with a special ‘flap’ under the sliding seat to stop water from moving back and forth in the boat. The below newsreel, ‘A Rowing Novelty’ from 1927, will show you how it would work. Rev. Sydney Swann Sr., rowed at Trinity Hall and rowed for Cambridge in the Boat Race in 1883, 1884, and 1885; winning in 1884. He also won the Cambridge Sculls, and was in the winning crews in the Pairs and the Grand (1886 and 1887) and the Stewards’ (1885 and 1887). In 1890, Rev. Swann went to Japan as a missionary, and there he won a numerous of sporting events, including pole-jumping, running, and hurdling. He returned to England seven years later. Back in England, he was the vicar for several parishes during the years. At the age of 55, Rev. Swann cycled, walked, ran, paddles, rowed and swam six consecutive half miles in competition with a lieutenant Muller of the Danish Army. They both did it in 26 min. and 20 sec. In 1934, Swann was elected President for the National Amateur Rowing Association, NARA, at the time a governing body for working class men who wanted to row, but was banned to join a club belonging to the Amateur Rowing Association, ARA. Both organizations merged in 1956 into the British Amateur Rowing Association, BARA, which shortly thereafter was shortened back to ARA.